Martha-In-Training: Christmas - 44 days away! I swear I do try to post on days other than Wednesday... I just work and have school so my moments of free time are few and far between. But it's Christmas Wednesday so let us rejoice! 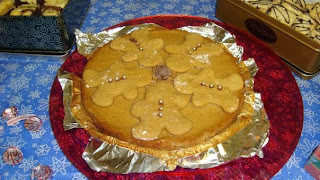 I absolutely love love love gingerbread. I used to always try to talk my mom into buying me the gingerbread characters (can't really say men as most were dogs, pigs, Ninja turtles, Kermit, etc) that some bakeries sell. So good. Not bad, right? I mean....I think it's pretty obvious which one is mine but for a first try I give myself a pat on the back. 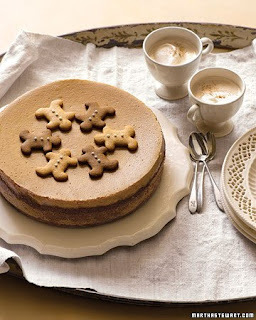 It's easy to make but requires kind of a 2-step process as you have to make the gingerbread dough before hand for the crust. And for the decorative men. I skipped the part where she suggested doing the two different types of gingerbread dough cause I made the cake literally hours before the party so I didn't have that kind of time. But the different shaded men do look pretty on hers. 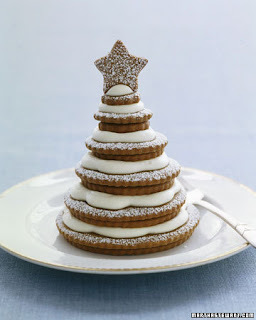 I definitely still want to do something with gingerbread this year so I was thinking of taking an easier route and making this fantastic looking Cookie-Tree. Plus that "snow" in between layers is cream cheese frosting and I loves me some cream cheese frosting. I put red candles on display that my grandmother gave me this past weekend. He accused me of decorating because of them. I blamed him of prejudice against red candles and the candles got to stay. John - 1, Jamie+Christmas - 1. My Dad handed me my December 2009 issue of Martha last night! I'm going to wait until I can savour every page and bookmark every recipe I see. Now, if you'll excuse me, I have to go take the red peppers out of the oven so I can stuff 'em full of risotto.